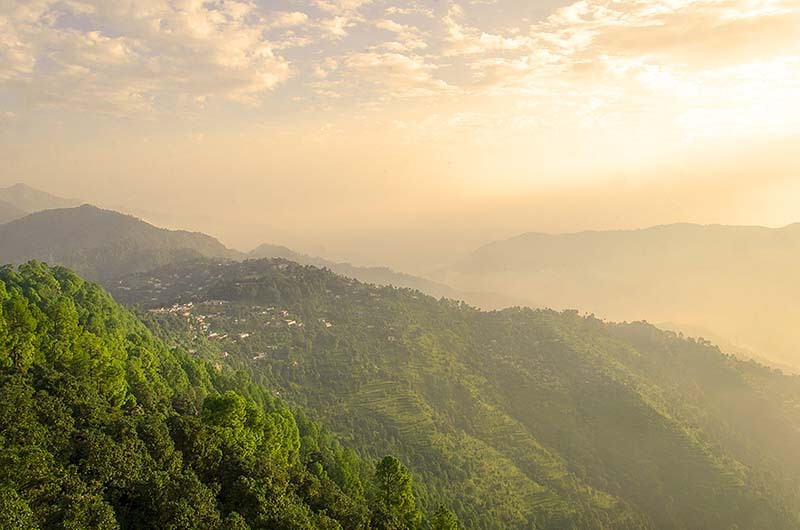 In my previous post, I talked about how you can plan a trip to Lansdowne; covering important details like how you can reach here, where to stay, frequency of public transport and other important tips that can be of help. Continuing in the same series, in this post, I will provide detailed information on tourist places in Lansdowne. To be honest, the entire small town of Lansdowne is a tourist attraction in itself. Even the 40 kilometers long drive from Kotdwar to Lansdowne will bring you through some really scenic vistas. The peace and tranquility of the place is like no other and that is what most people visit here for. Lansdowne is not yet crowded like some other well known hill stations are. The number of tourists you will find here will be comparatively very less; and it really gives you a chance to spend some time away from the crowd. Also Read: How to Plan a Trip to Lansdowne? With that being said, there are of course some places here that are definitely worth a mention and a visit. These can in a way be called your prime attractions of Lansdowne trip. What these places is what we will be talking about in this article. The following can be called as tourist attractions in Lansdowne. Some of these places are right there in Lansdowne and can be covered in a single day; while others are at a little distance from the main town; and may require you to stay for a couple of days more. Let me also provide a little information on all these places. This man made lake is by far the biggest attraction of Lansdowne; and not just for tourists but for the locals as well. It is quite a popular picnic spot and you will find plenty of families and kids around. This lake was in fact created with the sole intention of promoting tourism in the area; and as far as I can tell, it has served its purpose. You can also go boating in the lake for as less as Rs. 30 to Rs. 50 per person. There are a lot of ducks around the lake which becomes a great attraction for children. A beautiful garden with different varieties of flowers surrounds the lake. There is also a small park, a restaurant and a small handicraft shop right next to the lake. This place is actually known by multiple names. Mostly it is called Tip in Top but other names include Tip n Top, Tip at Top and Tiffin Top. It is located about 1.5 kilometers from main Lansdowne chowk and is a vantage point from where all the mountain ranges can be seen. Standing here, the entire valley is right in front of your eyes; presenting stunning views of Sunrise and Sunset. You can either drive here or just trek 2 kilometers to the top. Also Read: When is the Best time to Visit Lansdowne? It is a beautiful Catholic church built by Colonel A.H.B Hume of the Royal Engineers in 1895. The church is located on the way to Tip n Top and is known for its precise and magnificent structure. It stands tall in a really picturesque setting and is often called as hidden gem or jewel of Lansdowne. It is another Roman Catholic Church in Lansdowne; and is in fact the only running one. It was built by the English in 1936 in a typical colonial architecture style. It is located at the Mall Road, close to the St. Mary’s Church. Beautiful interiors and serene atmosphere definitely puts this church among must visit places in Lansdowne. Right in front of the church, on the opposite side of the road, is a great view of the majestic Himalayan Peaks. This temple is actually not in Lansdowne but on the way about 10 kilometers from Kotdwar as you start driving towards Lansdowne. It is located along the banks of Khoh River and is visited by majority of the locals around. The area around the temple is also a popular picnic spot in Kotdwar with its numerous waterfalls and dense forests. What is Bhim Pakora? It is actually a set of two huge stones on top of one another that looks like a “Pakora”. Why is it called Bhim Pakora? As per the legend, Pandavas stayed at Lansdowne for a while during their exile. One night, mighty Bhim with nothing to do put the stones on top of one another; and they have been that way ever since. It is said that the upper rock can be moved by the touch of a finger; but won’t fall down even if you push it by both hands. It is actually the mess of the Garhwal Rifles Regiment that is posted here. Built in 1888, It is said to be one of the oldest buildings in Lansdowne; and has been preserved and maintained by the state government. In fact, the entire set up of the cantonment area is a pleasant view. Photography is prohibited so please do not go around clicking pictures of Army structures. This century old Shiv temple is named after Sage Kalun who use to perform meditation here. Many other sages over the years have meditated here and their samadhis can be seen still. The Shiv-ling here is believed to be self-mounted. This war memorial was built in 1923 by Lord Rawlinson of Trent. Now located in the Parade ground of Lansdowne, it is often termed as the pride of Garhwal Rifles. Darwan Singh Museum was inaugurated in 1983 and contains rarest collection of Garhwal Rifles. It is located near the Parade Ground. It is another view point about 2 kilometers from the main market area. Places I mentioned above are the ones that can really be termed as main sightseeing in Lansdowne. You can cover all of them in a single day or 2 at most. If you however were staying in the town for longer then mentioned below is a list of some other places to see in Lansdowne. If you asked me, then I will call Bhulla Taal and Tip in Top as the two must visit places in Lansdowne. If you were interested in architecture or old buildings; you can also visit St. Mary’s Church and St. John’s Church as well; because both of these are kind of on the way. These were the only 4 places I visited during my first visit to Lansdowne. Rest of the places I covered when I went there a second time; and stayed for 2 days. There was nothing too spectacular about rest of the places though. Visit these if have time but if you didn’t then just cover Bhulla Taal, Tip n Top, St. Mary’s Church and St. John’s Church. I hope the information above on sightseeing in Lansdowne was of help. If you have any questions; or need any further details; please feel free to ask in the comments section below; or at our Community Forum; and I will be glad to answer. If you have been to Lansdowne and know of another place that is not in the list above, please do comment and mention.